You. Guys. I was working in Orange County last month with I Love to Create and Joann's getting my tie dye on with shoppers, and I stopped at a sample sale on the way home. First thing's first. I LOVE myself a sample sale. It's the one place where you can get your hands on more expensive branded gear for wayyyyyyy less than retail. This sale was at the Dainty Hooligan warehouse in Anaheim and I took advantage of the $1 bin that housed a ton of "damaged" items! I'm going to show you all the pieces I scored for a buck this week that I transformed into new, non-"damaged" items that look like they came right off the rack! I couldn't find the exact one on the site, however I found something similar for $42.50. So, I'd say I got a steal! But, the downside was that there were spots EVERYWHERE! ...and there's another few spots!! So, what do you do when you're stuck with a slew of spots on an ivory romper??? You know what to do. When in doubt, DYE IT OUT! Into a bath of glorious dye this romper went! After a quick roll in the dryer, my romper was a gorg shade of cornflower blue!! What I should have planned for was a bit of shrinkage even drying my new piece on low. So, note to self...air dry when there are no tags on a romper from a sample sale. Look how fab the crochet trim turned out too! My shoes were a steal of a score at Goodwill in Austin. Brand new Juicy Couture for $6.99. Holler! Because it was a little too short to wear out, I shot these lovely pics at home without worrying about flashing people in public. However, tomorrow...see how I made it public facing! 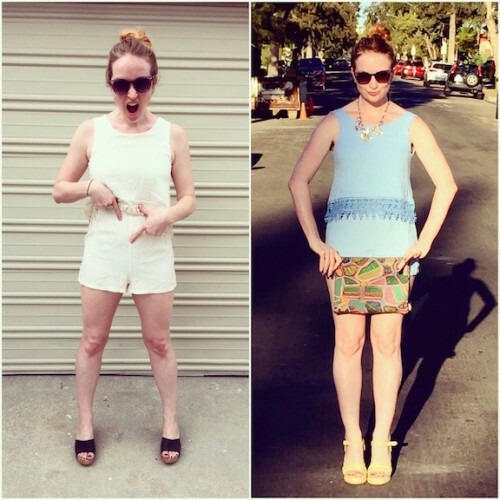 Check out the easiest little fix for when you end up shrinking your garments in 24 hours.